This short from Edison illustrates the ongoing challenge of finding new and dramatic subjects for early movies. In this instance, a sea-crossing, probably with the intention of shooting movies for American audiences in Europe, was interrupted by bad weather and the Edison team decided to shoot that, with minimal preparation. We see the railing of a ship, at an angle that suggests the camera is at middle of the deck A rope cuts through the image horizontally, directly in front of the camera. The horizon bobs up and down slowly, but to a considerable degree. We see swollen waves cresting, at least when the ship is low enough to permit it: at other times we see only sky off the deck. Two men stand casually at the railing, occasionally gesturing at the ocean. At one point, one of them reacts as if he had been splashed by a wave, but the water drops are invisible to the camera. 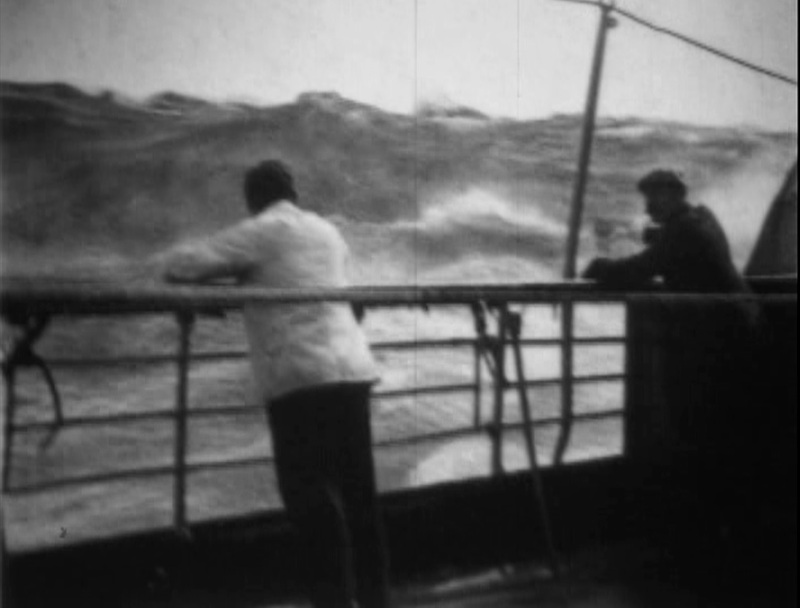 At the end of the movie, an image of the rolling sea without the ship or the men in the foreground has been edited on. The major problem with this film, from a modern perspective, is the two guys standing in front of the camera. They just lean on the railing as if they were watching a flock of seagulls fly by. They don’t hold on, or lean with the rocking ship, or give any sense of peril or drama. I assume they were told to get into the shot to give the scene some perspective and human interest, but their effect is to make the whole thing seem very off-hand. This is contradicted by the claims of the Edison catalog: “While our photographers were crossing the Atlantic Ocean a most wonderful and sensational picture was secured, showing a storm at sea. The picture was secured by lashing the camera to the after bridge of the Kaiserine Maria Theresa [sic], of the North German Lloyd Line, during one of its roughest voyages. The most wonderful storm picture ever photographed. Taken at great risk.” While the “risk” seems dubious, the rigging of the camera may have been somewhat innovative, as very few pictures had been shot in heavy seas at this time. It may also explain the rope we see passing in front of the lens, which may have been part of the arrangement to keep the camera from sliding all over the deck. Thank you for the comment! Of course, it stayed in the Edison catalog for some years and some exhibitors probably did screen it much later – there just wasn’t much content in those days. I also blog about films, and one of the segments is about these very first ones, that’s how I came across your website. I guess you don’t need tips, but in case you do: I use the “They Shoot Pictures, Don’t They” website’s 17K database to find which films to watch.